Is politics strictly a means to an end—something that serves only the interests of individuals and the various associations of civil society such as families and charities? Or is a society’s political common good an end in itself, an essential component of full human flourishing? Responding to recent influential arguments for the instrumentality of the political common good, Matthew D. Wright’s A Vindication of Politics addresses a lacuna in natural law political theory by foregrounding the significance of political culture. Rather than an activity defined by law and government, politics emerges in this account as a cultural enterprise that connects generations and ennobles our common life. 1. What’s your elevator pitch for A Vindication of Politics? How would you describe the book in two or three sentences? A Vindication of Politics argues that politics is an intrinsic part of what we need to flourish as social beings. It resists the modern impulse to view politics as simply a means to other ends and revivifies civic friendship by situating it within a political culture refined over generations. 2. What led you to research and write about the idea that politics is a cultural enterprise that connects generations and ennobles our common life? I had to work my way around to this argument, though I ultimately realized that on an intuitive level it motivated my resistance all along to the idea that politics is merely instrumental. It didn’t make sense of the patriotism I witnessed around me in Arkansas, where I grew up. I had either to disassociate patriotism and politics or wade into the murky waters of political culture and take a stab at conceptual precision. I resisted for quite a while, steeped as I was in the analytical outlook of most Thomistic natural lawyers. In the end, Edmund Burke helped me get where I was trying to go (in a way I take to be very consonant with the natural law tradition). Probably its conceptual scope. The book addresses one of the most fundamental questions of political philosophy, and at each phase there were a lot of different directions the argument could have gone. For example, in Chapter 2, I take up the familial good in order to compare and contrast subpolitical goods with political ones. But how to give an adequate account of the good of family life in one chapter? Should I explore the spousal relationship? Sibling? Parent-child? Emotional bonds? Moral education? The range of possibilities at each stage of the argument was quite broad and deciding which path made for the strongest argument was seldom easy. 4. 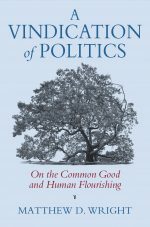 Your book offers new insight into the nature of the political common good and human sociability as well as their importance for making sense of the fundamental questions of American constitutional identify, principles, and aspirations. How, in your opinion, has the perception of politics for the common good evolved in the past century? Alexis De Tocqueville observed that there is a tight reciprocal connection between political association and civil association. The health of civil associations mitigates the tendency of democracies to create a political space dominated by the autonomous individual, on the one hand, and the omni-present state, on the other. The last hundred years has seen both the harrowing dissolution of civil society (for those on both the right and left) and the rise of the administrative state. In consequence, what discourse there is about the common good seldom includes as a necessary, intrinsic element the flourishing of civil associations like families, religious communities, charities, and so forth. But as I argue, the success of these groups is part of our political common good. Any theoretical account or political program that excludes them is, in my view, constructing a false notion of the common good. 5. As nasty as politics can be, the American public hopes for more from it than the quid pro quo of a business transaction. Can you speak to what effect the Trump administration has had on the public’s expectation of the government? There are, of course, many, many answers to this question. I’ll hazard a couple of observations. First, I think the Trump presidency demonstrates that politics is inextricably concerned with virtue. For many who support him, he’s the necessary wrecking ball wielded against a political establishment that is fast leaving traditional American values behind. For those who resist and the many who despise him, he’s proof that despite the distance and alienation we often feel in modern politics, we do care about with whom we share the bonds of citizenship. We want, as John Cooper observed of civic friendship, our fellow citizens to be “good, upstanding people, and definitely do not want them to be small-minded, self-absorbed, sleazy.” Second, I think disputes surrounding Trump evince the power of icons to control the moral and political imagination. Think for instance of the way the MAGA hat just framed the confrontation between the boys of Covington Catholic and a Native-American elder. As Burke observed, what controls the imagination becomes a commanding idea in the mind. Our failure of civic education leaves us with precious few positive American icons, and our impoverished political imaginations suffer for it. 6. What is one thing you would like readers to take from your work? This isn’t a surprising answer (and it’s cheating to treat it as “one thing”), but I’d love my readers to have a clear picture of what the common good is and why it matters. It’s a capacious, complex concept, and all such ideas are easily rendered meaningless by overuse and misuse. Hopefully, A Vindication of Politics can shed some helpful light on an important ideal. 7. What does building a political culture look like in the current polarized state of politics today? I think it first requires recognizing that we have a political culture. That is, no political culture is defined by the current leaders, citizens, conflicts, crises, and so forth. To think so is, as sociologist James Davison Hunter has observed, to mistake the weather for the climate. Political culture—the climate—implicates institutions, social and political practices, habits of mind, and so forth, all formed across generations of shared history. Aside from a meaningful education in that historical political culture, political conflict is readily reduced to an interest-driven turf war. As Burke said, “People will not look forward to posterity, who never look backward to their ancestors.” If you lack a sense of history, you will lack a sense of responsibility to preserve, reform, and bequeath our shared institutions, and present crises will take on world-ending significance. I think this accounts, at least in part, for the acrimony we see. So recovering a healthy political culture in the present will require a renewal of serious civic education. I don’t know that I could settle on one person. Of course, I hope my argument persuades the scholars with whom I interact and disagree. Some of those I disagree with the most, I learned the most from, and I hope my treatment of their work reflects that. John Finnis is a great example. In one important way, I offer a critique of his view of the common good. In many other ways, however, I find him very persuasive and always helpful. Author Matthew D. Wright is associate professor of government in the Torrey Honors Institute, Biola University, La Mirada, California.